The talks lasted about two weeks and by the time they finished, it had been secretly agreed that there would be a treaty, and I had a draft of one in the bottom drawer of my safe. It was never shown to anyone except Jack [Hickerson]. I wish I had kept it, but when I left the Department in 1950, I dutifully left it in the safe and I have never been able to trace it in the archives. It drew heavily on the Rio Treaty, and a bit of the Brussels Treaty, which had not yet been signed, but of which we were being kept heavily supplied with drafts. The eventual North Atlantic Treaty had the general form, and a good bit of the language of my first draft, but with a number of important differences. More than any human being Jack was responsible for the nature, content, and form of the Treaty...It was a one-man Hickerson treaty. The treaty was created with an armed attack by the Soviet Union against Western Europe in mind, but the mutual self-defense clause was never invoked during the Cold War. Rather, it was invoked for the first and only time in 2001 during Operation Eagle Assist in response to the September 11 attacks. The treaty includes Article 4, which triggers not military intervention but merely consultation over military matters when "the territorial integrity, political independence or security of any of the parties is threatened". It has been invoked three times by Turkey: once in 2003 over the Second Persian Gulf War (Iraq War), once in June 2012 after the shooting down of a Turkish military jet, and once again in October 2012 after Syrian attacks on Turkey and their counterattacks. An Article 4 meeting was invoked by Latvia, Lithuania, and Poland in March 2014 as a response to the extraterritorial Crimean crisis. Turkey announced plans to convoke under Article 4 an extraordinary meeting on 28 July 2015, ostensibly in response to the 2015 Suruç bombing, which it attributed to ISIS, and other security issues along its southern border. A press statement released by the Alliance declared that "Turkey requested the meeting in view of the seriousness of the situation after the heinous terrorist attacks in recent days, and also to inform allies of the measures it is taking." The US announced through The New York Times on 27 July that it had already agreed "in general terms on a plan that envisions American warplanes, Syrian insurgents and Turkish forces working together to sweep Islamic State militants from a 60-mile-long strip of northern Syria along the Turkish border... long-range artillery could be used across the border." Concerns were expressed that the plan would put allied warplanes closer than ever to areas that Syrian aircraft regularly bomb; the plan did not determine the reaction if Syrian warplanes attack allied personnel on the ground in what is Syrian territory. Turkish Prime minister Ahmet Davutoglu said the operations will continue as long as Turkey faces a threat, and discussed the situation with UN secretary-general Ban Ki-moon in a telephone call over the weekend of 26 July. The US said that Turkey "has a right to take action" against the PKK, a Kurdish insurrectionary group that has sought since 1984 autonomy from Turkey. A news report also disclosed prior to the 28 July meeting that Turkey had violated Iraqi airspace in its pursuit of the PKK. The key section of the treaty is Article 5. Its commitment clause defines the casus foederis. It commits each member state to consider an armed attack against one member state, in Europe or North America, to be an armed attack against them all. It has been invoked only once in NATO history: by the United States after the September 11 attacks in 2001. The invocation was confirmed on 4 October 2001, when NATO determined that the attacks were indeed eligible under the terms of the North Atlantic Treaty. The eight official actions taken by NATO in response to the 9/11 attacks included Operation Eagle Assist and Operation Active Endeavour, a naval operation in the Mediterranean which was designed to prevent the movement of terrorists or weapons of mass destruction, as well as enhancing the security of shipping in general. Active Endeavour began on 4 October 2001. In April 2012, Turkish PM Erdogan considered invoking Article 5 of the NATO treaty to protect Turkish national security in a dispute over the Syrian Civil War. The alliance responded quickly and a spokesperson said the alliance was "monitoring the situation very closely and will continue to do so" and "takes it very seriously protecting its members." On April 17, Turkey said it would raise the issue quietly in the next NATO ministerial meeting. On April 29, the Syrian foreign ministry wrote that it had received Erdogan's message, which he had repeated a few days before, loud and clear. On 25 June, the Turkish Deputy Prime Minister said that he intended to raise Article 5 at a specially-convened NATO meeting because of the downing of an "unarmed" Turkish military jet which was "13 sea miles" from Syria over "international waters" on a "solo mission to test domestic radar systems". A Syrian Foreign Ministry spokesman insisted that the plane "flying at an altitude of 100 meters inside the Syrian airspace in a clear breach of Syrian sovereignty" and that the "jet was shot down by anti-aircraft fire," the bullets of which "only have a range of 2.5 kilometers (1.5 miles)" rather than by radar-guided missile. On 5 August, Erdoğan stated that "The tomb of Suleyman Shah [in Syria] and the land surrounding it is our territory. We cannot ignore any unfavorable act against that monument, as it would be an attack on our territory, as well as an attack on NATO land... Everyone knows his duty, and will continue to do what is necessary." NATO Secretary-General Rasmussen later said in advance of the October 2012 ministerial meeting that the alliance was prepared to defend Turkey, and acknowledged that this border dispute concerned the alliance, but underlined the alliance's hesitancy over a possible intervention: "A military intervention can have unpredicted repercussions. Let me be very clear. We have no intention to interfere militarily [at present with Syria]." On 27 March 2014, recordings were released on YouTube of a conversation purportedly involving then Turkish foreign minister Ahmet Davutoğlu, Foreign Ministry Undersecretary Feridun Sinirlioğlu, then National Intelligence Organization (MİT) head Hakan Fidan, and Deputy Chief of General Staff General Yaşar Güler. The recording has been reported as being probably recorded at Davutoğlu's office at the Foreign Ministry on 13 March. Transcripts of the conversation reveal that, as well as exploring the options for Turkish forces engaging in false flag operations inside Syria, the meeting involved a discussion about using the threat to the tomb as an excuse for Turkey to intervene militarily inside Syria. Davutoğlu stated that Erdogan told him that he saw the threat to the tomb as an "opportunity". Prior to the meeting of Defence Ministers and recently appointed Secretary-General Jens Stoltenberg at Brussels in late June 2015, it was stated by a journalist, who referenced an off-the-record interview with an official source, that "Entirely legal activities, such as running a pro-Moscow TV station, could become a broader assault on a country that would require a NATO response under Article Five of the Treaty... A final strategy is expected in October 2015." In another report, the journalist reported that "as part of the hardened stance, the UK has committed £750,000 of its money to support a counter-propaganda unit at NATO's headquarters in Brussels." Article 6 states that the treaty covers only member states' territories in Europe and North America, and islands in the North Atlantic north of the Tropic of Cancer, plus French Algeria. It was the opinion in August 1965 of the US State Department, the US Defense Department and the legal division of NATO that an attack on the U.S. state of Hawaii would not trigger the treaty, but an attack on the other 49 would. On 16 April 2003, NATO agreed to take command of the International Security Assistance Force (ISAF) in Afghanistan, which includes troops from 42 countries. The decision came at the request of Germany and the Netherlands, the two states leading ISAF at the time of the agreement, and all nineteen NATO ambassadors approved it unanimously. The handover of control to NATO took place on 11 August, and marked the first time in NATO's history that it took charge of a mission outside the north Atlantic area. On 16 January 1963, the North Atlantic Council noted that insofar as the former Algerian Departments of France were concerned, the relevant clauses of this Treaty had become inapplicable as from 3 July 1962. ^ Joined as Kingdom of Greece. ^ Joined as West Germany. ^ a b "Theodore Achilles Oral History Interview". Truman Library. Retrieved 2014-05-29. ^ Bevans, Charles Irving (1968). "North Atlantic Treaty". 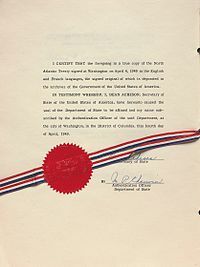 Treaties and other international agreements of the United States of America 1776–1949. Volume 4, Multilateral 1946–1949. Washington, D.C.: Department of State. p. 831. LCCN 70600742. OCLC 6940. Retrieved 2013-05-01. ^ "NATO Declassified - Treaty Signatories". NATO. ^ "The consultation process and Article 4". NATO.int. 4 March 2014. Retrieved 4 March 2014. Since the Alliance's creation in 1949, Article 4 has been invoked several times.... On two occasions in 2012, Turkey requested that the North Atlantic Council (NAC) convene under Article 4: once on 22 June after one of its fighter jets was shot down by Syrian air defence forces and the second time on 3 October when five Turkish civilians were killed by Syrian shells.... Previously, on 10 February 2003, Turkey formally invoked Article 4 of the North Atlantic Treaty, asking for consultations in the NAC on defensive assistance from NATO in the event of a threat to its population or territory resulting from armed conflict in neighbouring Iraq. ^ Ford, Matt (1 March 2014). "Russia's Seizure of Crimea Is Making Former Soviet States Nervous". The Atlantic. Retrieved 4 March 2014. Linas Linkevicius, Lithuania's foreign minister, responded on Saturday by invoking Article 4 of the North Atlantic Treaty ... for only the fourth time in the alliance's history. ^ Baker, Peter (3 March 2014). "Top Russians Face Sanctions by U.S. for Crimea Crisis". The New York Times. Retrieved 4 March 2014. NATO called its second emergency meeting on Ukraine in response to a request from Poland under Article 4 of the North Atlantic Treaty relating to threats to a member state's security and independence. ^ Ford, Dana (2015-07-27). "Turkey calls for rare NATO talks after attacks along Syrian border". CNN. Retrieved 2015-07-27. ^ Daley, Suzanne (2001-09-13). "AFTER THE ATTACKS: THE ALLIANCE; For First Time, NATO Invokes Joint Defense Pact With U.S." The New York Times. ISSN 0362-4331. Retrieved 2017-05-26. ^ "Turkey: Syria's jet downing an attack on the whole of NATO". TodaysZaman. Archived from the original on 26 June 2015. ^ Ankara warns against attack on tomb, Hürriyet Daily News, 7 August 2012. ^ "Ankara Bar Association challenges YouTube ban". TodaysZaman. Archived from the original on 27 June 2015. ^ "Turkish journalist detained over leak of key Syria meeting". TodaysZaman. 29 March 2014. Archived from the original on 27 June 2015. ^ YouTube ban: How Turkish officials conspired to stage Syria attack to provoke war RT, 28 March 2014. ^ NATO. "NATO – Event: Meetings of NATO Ministers of Defence, 24-Jun.-2015". NATO. Wikimedia Commons has media related to North Atlantic Treaty. "NATO Declassified - The Founding Treaty".